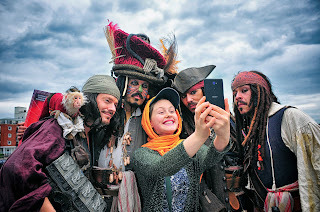 The Isle of Wight’s annual Festival of the Sea this year sets sail on June 23, for a voyage that will last until July 9, and with the range of nautical festivities - including a pirate festival on golden sands, delicious seafood fresh off the boat, and spectacular yachting extravaganzas featuring thousands of boats. They will be hoisting the Jolly Roger to give young scallywags the chance to join a Scurvy Crew at Blackgang Chine, where there will be opportunities to learn how to sword fight like a true Blackgang Buccaneer and take part in the smugglers’ next treasure hunt. A strenuous 26.5-mile hike/run across the Isle of Wight at night. It’s a chance to walk from the Needles Landmark Attraction to Yaverland to raise money for Challenge & Adventure a local charity that helps disadvantaged and challenging young people on the Isle of Wight. A ‘lite’ route (12 miles) or kids route (4 miles) is also available. This most famous of annual yacht races, and the largest of its kind in the world, regularly attracts entries exceeding 1,500 yachts and upwards of 12,000 sailors racing the 50 nautical miles westabout course around the Isle of Wight, starting and finishing in Cowes. Isle of Wight Symphony Orchestra present "Carnival at Sea"
A 'Carnival at Sea' by the Isle of Wight Symphony Orchestra at Medina Theatre, from 7:15pm. This family friendly concert will celebrate the Islands strong links with the sea - with a programme that includes Rule Britannia and Pirates of the Caribbean. A day-long carnival event by the sea. Take advantage of a free day of fun and celebration with a parade and festival at the beach. Ahoy there! Join in a thrilling pirate festival set on a spectacular beach, on an enchanted isle. Expect live pirate music, cannon and firearms demonstrations, stunt action sword fights, young pirates entertainment and much, much more skullduggery. The Classic Week, now in its 11th year takes place in Cowes, on the Isle of Wight. Since 2010, it is the only UK regatta forming part of the Panerai Classic Yachts Challenge series, the leading international circuit for classic and vintage yachts. Social events included as part of the week include an Open Yachts Pontoon Party on the July 9; a Themed Crew Party – “Pirates of Penzance”- on July 10; a prize giving Gala Dinner on the July 12 and the famous Parade of Sail past the Royal Yacht Squadron on the final day, July 13. A Regatta for the International Dragon fleet. Designed in 1929, the International Dragon combines classic elegance with grand prix performance, the world’s greatest sailing venues and some of the best sailors from around the globe. One of the Dragon fleet’s most prestigious trophies is the Edinburgh Cup which was presented to the class in 1949 by HRH The Duke of Edinburgh and is awarded annually to the winner of the International Dragon British Open Championship. For full details of the Isle of Wight’s 2017 Festival of the Sea, visit Isle of Wight's website.